A couple of years ago, by husband and I bought a new couch as a (VERY) belated wedding present. The old leather couch, love seat and chair (hand-me-downs from Justin’s parents) made their way to the spare room – a stopping point for most things headed to the dump. For months now I’ve been threatening to paint the old set with Chalk Paint™ By Annie Sloan and as a part of my Procrastinate Less initiative for 2016 I decided that the time has come. Now, I won’t lie to you. The outcome was AMAZING but the whole thing was A LOT of work. However, it was well worth it since for around $100 I have a whole new set of seating perfect for our sun room. Below is the first part of the project – the paint. The whole thing took an entire day from 9 am to 6 pm but to be fair that might have included lunch, dinner, and a couple loads of laundry. Below are the materials I used and a step by step tutorial. In part two (happening hopefully next weekend) I will talk about waxing our freshly painted furniture to protect it. When we were buying our house there wasn’t a lot of money left for fancy furniture so we settled on a couple of pieces (some bought – others donated from Justin’s parents) which included a leather furniture set in a tolerable but not stunning shade of (patchy) cherry brown leather. Over the years, the cushions became scratched, discolored and dingy but the actual furniture was still functional. Since it was headed for the dump I decided to experiment by painting it with Chalk Paint™ By Annie Sloan in French Linen. I used a synthetic bristle brush in 2″ to minimize the brush marks. On its own, the paint is thick which is great for creating interesting texture on furniture and accessories but wouldn’t work so well for this project. To keep the paint flexible, the trick is layer very thin coats, painting each coat in an opposite direction than the last. I used two different thinning mixes on the furniture. For the parts that have the most give like the seat, back and armrests, I thinned the paint out 30%. This will make the paint pretty runny so don’t load up too much on the brush to avoid runs and drips. The key is to brush out a thin layer which will dry very fast (even on a rainy day the coats dried in 30 minutes) and avoid heavy coats since a thick layer of paint will crack. On parts that didn’t flex as much like the sides and back, I thinned the paint out only 10% which meant better coverage in less coats. After the first coat DON’T PANIC. I promise your furniture will look better after every coat as the colour becomes more opaque and the coverage improves. The thin wash will keep the paint flexible and prevent it from cracking but it does look a mess for the first few layers. You’ll know when it’s time for the second (and third and fourth) coat when the first is totally flat and no shiny spots are visible. In total, I painted 6 thin coats on flexible parts like the cushions/arm rests and four coats on the back and sides. Since Chalk Paint™ By Annie Sloan has no smell, I didn’t have to move the furniture out of the room and only turned on the fans to help with drying time. For all the pieces – couch, loveseat, chair and ottoman, I used 2 quarts of paint and will probably need a large 500ml tin of clear wax (more on that next week). Since I am not a patient person, I couldn’t wait to sit on the chair which didn’t crack (YAY). However, in the classic manner of “do as I say – not as I do” I would strongly suggest waiting at least 48 hours before touching, flexing or waxing your painted leather (or fabric) pieces. This gives the paint a chance to cure. If you liked this post don’t forget to check back next week to see what’s new on the blog but if you can’t wait our Facebook page is updated daily with amazing spaces, design tips and DIY projects. Or get a sneak peak at life behind the scenes at the paint store (and more stunning rooms) on our Instagram page here. Thank you Colleen. I’ll be honest, it was A LOT of work since painting all those coats was pretty time consuming but SO WORTH IT! This coming weekend I’ll be waxing so stay tuned to see how it turned out. When you say ” I thinned the paint out 30%” .. do you mean 3 parts paint and 7 parts water? The opposite – 70 paint and 30 water. Other wise the paint would be super thin and you would be doing SO MANY coats! So happy I came upon this post. We bought new leather sofa and love seat. I was thinking of re-covering the ottoman we had. Now I know exactly what I will do with it. Looking forward to next time to see the waxing process. Thank you for visiting our blog Carol. I will be waxing on Sunday with an update so stay tuned and enjoy your weekend. I love that you included a video, that was really helpful. I have been researching painting furniture and was having a hard time discerning how the texture turned out. Thanks for the great tips on keeping the texture nice and the paint flexible. What is your opinion on using different kinds of paint for a project like this? Thank you visiting! I found that the Chalk Paint™ By Annie Sloan worked very well because it stayed flexible. I haven’t tried other acrylic architectural paints but I suspect they would flake off over time. Plus the Annie Sloan soft wax protects the finish. I understand that there are other leather paints (which I see I primarily used on shoes) but I haven’t had a chance to test them so unfortunately I have no feedback available. If you try some let me know! Hi, what kind of paint thinner/mixture did you use to thin the paint ? The paint is water based so I used water for thinning and clean up. ty 🙂 I am debating using the AS chalk paint you used versus Saphir Tenax leather color spray paint to repaint an old leather couch. I am going to buy a can of the spray paint today and test out a patch on the back of the couch. If I don’t like the result I will try out the AS. I want a royal blue/sapphire blue color.. so I have to see how well the color looks after drying. If you’re looking for a royal blue try the Annie Sloan Napoleonic Blue. It’s really rich. I haven’t tried the spray but let me know what you think! How did you prep the furniture? Good evening Jennifer. I cleaned the surface with some white vinegar and water (50/50) and let dry. A little scuff up with a scotch brite pad wouldn’t have hurt but the paint stuck very well. Have a great night! This looks really fantastic and I’m all set to paint my own leather sofa. Does yours get a lot of use and how has it held up so far? Mine will probably be jumped on by my two children a lot so I’m a bit afraid it might not cope with this too well! Thank for visiting the blog! I’ll be totally honest with you – on the couch it’s me and my husband for a few hours every night. The paint looks fine but it doesn’t get that much wear and tear. I would probably try a small piece first (like a chair or ottoman) and have your kids put it to the test. Remember to put on light coats to keep the paint from cracking. Hope that helps! Thank you, I think I will try out the back of a cushion and get them to jump all over it! I’ve tried a small patch and I find that on second and even 3rd coats that as I brush I can see underneath to the leather slightly. Did you get this? Is this what alternating the direction of the brushing helps with? Thank you so much for your help! Make sure you’re using a synthetic bristle brush. It will minimize brush marks and make the finish super smooth. I DID alternate the direction of the brush stokes on the cushions. In total I did 6-7 coats of paint to get full coverage. The paint was really thin so it took more coats but it stayed flexible. Let me know how you make out! Is the couch comfy still??? Or is it scratchy after paint dries?? The couch is super smooth and silky but you do have to apply the Soft Wax to protect it. I wonder if it this will work in a bonded leather couch. What do you think? Good evening Cinthya. Bonded leather is usually coated and the coating might prevent the paint from sticking well. Before you get started I would scuff it lightly with a scotch write pad. Have a great night! Could you use this paint/technique on a leather purse? Hello Darlene. I don’t see why it would’t work on a purse – it works great on shoes! The technique would be the same; layer thin coats of paint to keep it from cracking and then seal with wax the next day for protection. Have a great weekend! I’m curious why you didn’t use spray chalk paint. I’m thinking about painting a pair of shoes but had planned to use a spray can. I used spray on a couple of vases and it was beautiful. You mentioned waxing after painting. What wax would I buy? Good morning Barbara. I didn’t use the spray paint for a couple of reasons. It’s super messy and you have to mask off everything. Plus, I find that thinning the paint and brushing it on gives me more control over application. I sealed with Annie Sloan Soft Wax in Clear for protection and a bit of satin sheen. Hello, I see this post about your chalk painted couch is a few years old. Is the paint still holding up? And still soft? I am a chalk paint beginner and just finished my kitchen table and would love to try more furniture. Thanks! Good morning Angel. Unfortunately that room is now on its way to becoming a laundry so we got rid of all the furniture but it did hold up for a year. Good luck with your furniture! that means you havent any trouble with skimming colour or other problems like that? We didn’t have any problems for the time that we had the furniture. The way seals the paint and gives the leather a really nice silky feel. Good morning Sarah. You will need to repair the crack first with either a little leather glue or a patch. Then sand your repair smooth with the rest of the couch. Have fun! was it hard to keep the arm rest from sticking to the seat cushion? we have recliner couches that the coushions don’t come out on and wondered how to keep those areas from sticking together. Our cushions didn’t come out either which was a giant pain. What worked the best for us was a team effort. I painted while my husband held back the armrests then I used a blow dryer to dry the areas well before letting the cushion fall back into place. That was the biggest pain! In the end I found that a team approach worked best. My husband held the cushion back from the arm rest, I painted it and then used a blow dryer to dry the paint before releasing the cushion back into place. Bummer! The Annie Sloan dried really fast which was a saving grace and after waxing, it never stuck or rubbed off. The trick I think was the thin layers. I never thought about the wood clips. Thank you for the tip! Thank you for visiting! Since the couch painting we have turned our spare room into a (very large!) laundry room and the furniture was given away. However, it held up great for the time that we had it. Is your chair leather or fabric? Can you use this method on bonded leather that is peeling or only in genuine leather? Bonded leather is pretty tough because it’s smooth and not very porous so there’s not a lot for the paint to stick to. Before painting I would scuff up the leather with a sanding pad to break the surface tension. Wow…I want to paint our leather sectional couch, its a yellowy white color and I want it more white….How often would you repaint or relax to keep up the finish? 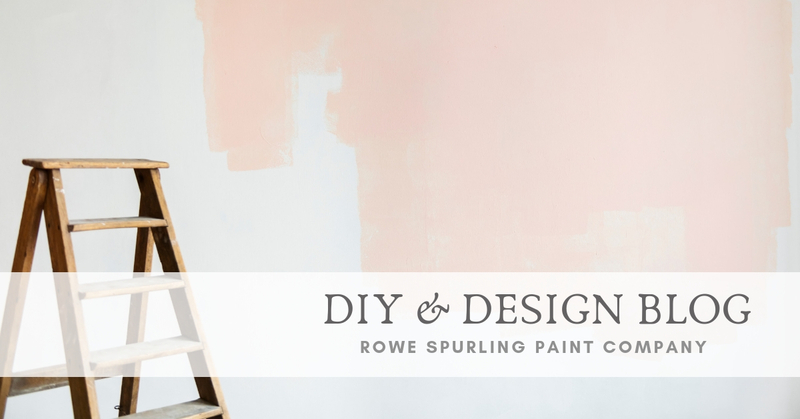 Also have you heard of Amy Howard paint? Its supposed to be better and hold up better than Annie Sloan? Hello Nikki. I have heard of Amy Howard paint but Annie Sloan’s has been around for over 25 years so I’m confident in its performance. I would say that you’re probably going to have repaint every few years especially if it’s a very light colour. Hi there, did you use water to thin out the chalk paint? Yes – about 25%. It keeps the paint from cracking. Hello Amanda. Thank you for visiting. Earlier this year we turned that room into a laundry room so sadly the furniture is no longer with us. For the duration of its life it held up great – no complaints! It never cracked, peeled or rubbed off. I think the secret is to layer very thin coats to keep it flexible. Have a great day! I’m just wandering after it is done how well it held up. I have a leather set I would like to paint. But we have children in and out a lot. Has this held up well? Thank you for visiting. We have since renovated that room and since we re-purposed it as a laundry all the furniture was donated/disposed of so I’m not able to tell you what it looks like today. However, for the time we had it, the love seat and chair were used daily and help up great. The trick is to layer thin coats of paint to keep it flexible, put on a few thin layers of wax to protect the finish and remember that the wax takes about 28 days to cure so you will have to be gentle on the furniture for a few weeks. Have a great weekend! Hello Lauren. Thank you for visiting. I think that sanding down the old leather is a great idea! Use a fine grit paper like 240 – 280 grit to smooth down the leather. You might also want to give the chairs a light sand with 360 grit paper between coats of paint. Good luck! Will it work on faux leather and did you have to sand it before applying the wax. Good morning Tina. Faux leather is not porous so I would give it a light sand with 240 grit sandpaper. HELLO! I recently acquired a free faux leather couch (in white-or more like off white right now) and since I am going to be painting my wood paneled room white (as opposed to the dark brown it is now) I like the idea of painting the new-well used couch. Now that its been a couple years, how is your furniture holding up? Does the color still look great? Last year we repurposed the room into a laundry room so the couch was given away but it looked amazing for the entire time that we had it. Recently we also got some feedback from a customer who used Chalk Paint to upcycle some old fabric chairs that she rents for weddings and events. They’re holding up great even in those high traffic situations. The only problem you might have is that the faux leather isn’t very porous so there will be little for the paint to stick to. I would suggest a light sanding with 220 grit paper to scuff up the surface before painting. Good luck and thank you for visiting! hello what about the coach peeling a little……do I still need to light sand as well? Hello Stephanie. I would give the couch a LIGHT sand if it has that shiny finish. It will help the paint to stick well. Don’t forget to layer thin coats of paint to prevent cracking.